Afternoon Slump is a term used to describe the sleepy, tired, and sluggish feeling that comes on in the afternoon, usually between the hours of 1 p.m. and 3 p.m. 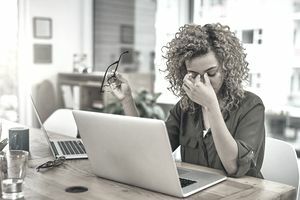 There are many different reasons people experience afternoon slump, but the symptoms are generally the same or very similar. Understanding what causes your run-down feeling in the afternoon is important to figure out how to address it. It's also important to know what quick-fix cures will alleviate the run-down feeling. A serious afternoon slump is more than just feeling like the day is getting long and a nap would be nice. It is marked with a profound sense of tiredness or fatigue that makes it hard to focus and may be accompanied by an intense need to sleep. Sit in the Sun for 10 minutes: You can reset your internal clock, reduce the amount of melatonin your body produces, and boost your vitamin D.
Consume Protein Rather than Carbs: Try tuna salad but skip the bread; sliced chicken instead of pasta, and a salad with an egg. Cutting out the carbs can make a difference in feeling an afternoon crash come on. Rub Some Peppermint Oil on your Hands: Rub your hands together and then pat your face. The scent of peppermint is a known to increase energy. Eat a Square of Dark Chocolate: Dark chocolate is very healthy, unlike milk chocolate, with high levels of healthy fat and antioxidants it contains. It also provides a touch of caffeine to give you a boost. Chew Gum: Chewing gums with strong minty flavors like peppermint and spearmint are stimulating, and the act of chewing helps the brain fight feelings of lethargy. Do Isometric Exercises: By tensing a muscle and holding it, you encourage blood flow. Try tensing your biceps, holding for 5 to 10 seconds, and then releasing. You can do the same with your calves, thighs, chest, stomach, and glutes. Put a Rosemary Plant in your Office: The scent of rosemary is known to be energizing. Whenever you need a pick me up, rub a sprig between your fingers to release the fragrance. You can also rub one on your hands, neck, and face. Have a Healthy Snack: Munch on something that combines protein, fiber, and complex carbohydrates (such as whole-grain crackers or raw vegetables) to raise your blood sugar levels and keep them up. Add a Bit of Variety to your Day: Concentration declines after about an hour, and it only gets worse from there. Without a break, the tedium of a task will be mind-numbing by the time you’re 90 minutes in, and you’ll lose your productivity. When you feel your focus fading, switch to something else for 30 minutes. Stay Active: Even short bursts of activity can keep you alert and boost your fitness. If you're in an office, instead of emailing or calling colleagues, get up and walk to a colleague's desk to ask a question face to face. If you're home, visit a next-door neighbor (even if it's to borrow a cup of sugar). The change of scenery alone will be a pick-me-up. Play a Tune: If you like music, insert your earbuds or put on your headset and jam out to one of your favorite high-energy songs. It will instantly invigorate you and make you feel pumped. Be Social: Organize your time, so you engage with others during those peek slump times when your concentration and energy are waning. We are social animals, and interactions always rev us up. But make sure it’s an interesting, interactive activity. Sitting in a room listening to someone else drone on and on will just send you snoozing. Engage in Mindful Meditation: There are all kinds of mediation (TM, or transcendental meditation, being the most popular one). Meditation requires no more than 15 to 20 minutes of sitting quietly and focusing on yourself and your breathing. Meditation will not only declutter your mind but leave you energized. Try Some Yoga: If you're not the high-energy type, then try chilling out with some stress-free yoga positions. Yoga not only alleviates the damage done to your body by sitting in a chair for too long but will significantly boost your energy level.